If you get a thrill from instant gratification, consider a lace cap. They look like you spent some time on them, even though they only take a couple of hours to complete. Yesterday's chilling wind reminded me that I didn't have a hat; some bargain chunky yarn at Jo-Ann's and about two hours of my time; problem solved! This hat was made using the Foliage pattern by Emilee Mooney, which was published in Knitty. If you've never been to knitty.com, it's a great online magazine with tons of free patterns! 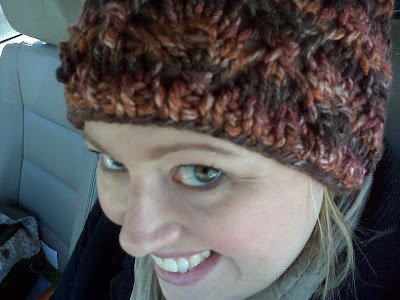 I loved that there were instructions for both bulky and medium weight yarns for this hat. I wore it out during our errands this morning, and my head was oh-so-greatful! Knit in a top-down construction, I wasn't sure how it would all come together, but I really like it. I'll definitely use this pattern again. Ahh, gives me the chills! I'm so excited! Even better? I think I'll be on the West Coast (and unpregnant) for this one, so I don't have to cry in my virgin cosmo thinking of all my girlfriends going together...Look out girls, W is coming to town! On Christmas Eve we spent an evening of food and fun, eating Gino's East chicago-style deep-dish pizzas, drinking some great Pinot and basking in the glow that is six children playing for two hours without incident. When we got home, J quickly bathed the kids and got them ready for bed as I started on stocking #2. We'd already threatened H with the outcome of Santa not arriving with his gifts if he didn't stay in his own bed, so felt fairly confident he'd stay there all night. I let H stay up long enough to pick out the order of his stripes on his stocking and then off to bed he went. Mid-stocking J decided to order an on-demand movie. I can't remember the last time we were both home to watch a movie, so I was excitedly finishing up my project so I could snuggle (no, we don't have a Snuggie with which to snuggle) up with a glass of wine and watch a feel-good flick with my husband. From my sewing station at the table, I heard the opening dialogue...'What movie did you pick?!' To which J answered with a half-hidden smile 'You don't want to know.' Ummm, yes, yes I do. This isn't some obscure Netflix movie you've sequestered yourself upstairs with headphones to view...this is our Christmas Eve get-us-in-the-feelgood-mood-to-be-elves movie. Orrrr Drag Me To Hell. Yep, my lovely husband chose the new Sam Raimi movie for us to ring in the holiday cheer. I was immediately incensed. Then, I walked over to look at the opening credits; wait! Justin Long is in it? Hm, maybe it won't be half-bad. Once he told me that it was part of the Evil Dead saga I acquiesced because I actually like that genre of campy horror, and it was hilarious! Lace caps have become a new fun project because if you use a worsted weight yarn they're as functional (in keeping your head warm) as they are nice to look at. I used a purl decrease on this one just for a little something different visually, but I don't know that I'd do it again. Hats are great because they are easily completed in one sitting...I watched The Hangover and part of Inglorious Basterds (found in my stocking), did all of our laundry and made this hat last night. Hats are great stash busters, and a great way to try new stitches or skills. Have fun! Although the prep was a little bit tedious and took about two hours, the actual construction of the stocking, including the cuff, was about 45 minutes. Constructed by stitching three-inch strips of fabric in an intentionally haphazard way to a backing fabric that already has batting fused to it, each stocking is comprised of two panels that are then sewn together and turned inside out after adding a cuff. At 1:30 am after I successfully turned out my first stocking, I decided to call it a night and put things back in their place until Charlie's nap today. Sometime between cupcake and macaroon-making, store runs, gift-wrapping and, oh yeah, showering, I'll have three more lovely stockings so that we actually have something to stuff tonight! I'm pretty pleased with the final product. The fact that it actually looks like the picture just shows that it's a pretty idiot proof method...try it for yourself! With all the business around the holidays, I forgot to post one of the most exciting things that has happened for us; we know where we're going to land post-residency! 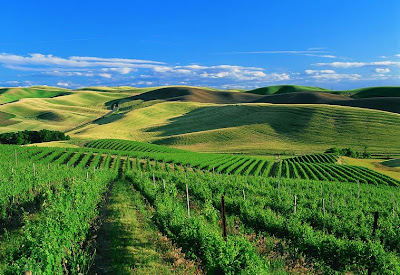 We'll be moving to the sleepy Walla Walla Valley, where vineyards abound and the character of downtown puts a smile on your face. Moving also means househunting, and we're pretty sure we're going to build, so it's a big step, a fun step, and I'm sure you'll hear all about the mis-steps. Oh, and we'll be getting a dog, per H's request when we move, so there are sure to be puppy potty and poo stories to make your day start off with a bang. Congratulations to Erin M. for winning a Family Pack of Tickets to see Disney on Ice at TD Garden in Boston on opening night! (December 26th). Even if you didn't win, you can still get a super-affordable family outing by entering the code MOM at ticketmaster.com for a Monday through Friday Matinee of Disney on Ice for just $44! You can even purchase additional tickets for just $11. Have a great time, Erin! I knew when I planned my trip home that I'd be gone for all of November, returning to my home on St. Nick's Day. That holiday should have tipped me off to just how close I'd be to the next big one...how did I ever think that I could go from zero to Christmas in just three weeks?! This year, we're doing a simple Christmas in many ways, but also more than some years in others. For the first time we have a live tree. Of course, because of our fantastic planning, I spent the time that J had available to accompany me on said tree-finding mission purchasing all the accoutrements...you know, like a tree stand? I was actually proud of myself that I went to Christmas Tree Shops and bought the tree stand tray, a tree skirt, lights and ribbon before coming home with a huge tree. That left me in the parking lot of the Episcopal church with both kids at 6:30 the other night because I'd promised Henry that that was the day we'd get a tree. As I'd gone to Alex's house earlier to help her swap out her tree stand for one that would accomodate her tree's trunk, she volunteered to come help me with mine. I did not, thankfully, have delusions that I'd be able to hold the tree and screw it in solo. After hefting the tree from the top of my car, I carried it up the flight of stairs and into my living room. It was a surprisingly effortless ordeal, and before you know it, I was vaccuuming up the first of many, many needles before putting Charlie to bed. H got to stay up with me, and we decorated the tree together. Earlier in the day, we'd made our own star; he requested silver, so we used embossing ink and powder, some swirly stamps and, of course, sparkly brads. A little free-hand cut and voila! A star is born. While I was at the beloved Christmas Tree Shops (a store I live less than a half-mile from, but had not entered the entire time I lived here until the last couple of months...which is full of everything you never knew you didn't need but couldn't live without. Bath and Body-works knock-off hand-soap...for a dollar?! I'll take seven!) I also picked up some shiny ball ornaments and a little holiday kitch. I stole the brilliant idea of my sister-in-law to fill regular drinking glasses with the shiny balls and put them on my sconces instead of candles, then filled a clear vase with them and put them by the entertainment center. I then strung a gauzy ribbon across one wall garland-style so that I could tack up our Christmas cards* as we received them. When we were all done wrapping the tree in a tulle ribbon and lights, I brought down the two boxes of candy canes (I decided to forego ornaments this year in light of my children's grabby hands) and he was so excited to arrange them in one giant cluster, which I anally re-arranged after he'd gone to bed. When we were all done he said 'Now, when people come over, they're going to see that our house is all decorated! They're gonna love our decorations!' It wasn't until then that I realized how important it was to take the time to get in the holiday spirit. I look around every night at our lit tree and the shiny ornaments and for a moment, I don't care how much I have to get done before the big day...and then the moment's gone. Disney On Ice-100 Years of Magic! When I was little, I had a best friend who always got to do what I thought were super cool things. The coolest, though, was that she got to go to the IceCapades...more than once. Alas, poor little SallyHP sat at home in rural Eastern Oregon with not an ice rink in sight. I knew there was a reason we moved to NewEngland! This month, Disney on Ice will be coming to TD Garden in Boston to celebrate 100 Years of Magic! From Mickey Mouse to Woody and Mr. Increcible you'll be dazzled by the characters that fill your home. In light of the current economic situation, MomCentral has asked that we spread the word about an awesome opportunity to get a Four-pack of tickets for only $44 when you go to a Monday-Friday matinee show. (You can even get more tickets for $11 each!) The code MOM will not only get you the four-pack at a great price, but you can also choose to save $4 off Friday night and weekend shows. If you're still trying to think of a great stocking stuffer for your kids, this may be it! Go to www.ticketmaster.com and use the code MOM to get your great discount. Show Dates in Boston are as follows: Saturday, December 26: 11:00 AM, 3:00PM, 7:00PM. Sunday, December 27: 11:00 AM, 3:00 PM Monday, December 28: 11:00AM, 3:00PM Tuesday, December 29:12:00 PM and 4:00PM. Last, but certainly not least, I've been given the chance to offer a four-pack of tickets for FREE to one lucky commenter for opening night; December 26th at 7pm in Boston. Your tickets will be available at will-call with valid photo ID. Comment today and win! Drawing will be held Friday at noon EST and the winner notified via email, so please include that information! I would like to preface this post by saying that I am by no means downplaying the importance of ensuring gynecological health. Nor am I saying that screening for cervical cancer is not a serious matter. I religiously attend my annual exam, and have never complained about it. It's a whopping fifteen minutes of my time each year. I do, however, have to say that whoever is behind CBS' new PSA campaign maybe needs to re-think the delivery. If you haven't yet seen the commercials in which Mr. Suave actor tells you the something special you can do for 'your woman' this year is to schedule her pap smear, then I've included it in the post for you. I can only imagine men across America as they innocently look at their wives and say..."Baby, I gave you the gift of life. Not even Santa can bring that." There's even a version for Hannakuh...does that mean you have to get eight pap smears? I'm pretty sure most men wouldn't be too jazzed if their woman slipped an appointment card for a colonoscopy or prostate exam into their stockings instead of Guitar Hero. But that's just my humble opinion. How about I'll schedule my annual exam all by myself...I'm a big girl. For one of our last nights away from the land of taxes, we stayed with our friends in Portland. In order to facilitate the evacuation of wiggles, we went to Out of This World Pizza so that the kids could run and run and run in the warehouse-sized playland and eat dinner in one fell swoop. H and Charlie were having a magnificent time with the giant slides, swirly bumper carts and play houses. I wish we had something like this at home because in addition to being a great place to take the kiddos, the pizza was really good...not something old Chuck E. can claim. Plus the animatronic band is just plain creepy. As we were eating, H quickly lost interest in his slice o' cheese, and ran off to play. After about twenty minutes, I realized I wasn't doing the best parental supervisory job and headed off to find him. Walking across the squishy mats in my trusty Dansko clogs, I spotted H in the plastic Little Tykes-style house as he was slamming a window. I quickened my pace so that I could remind him that 'We don't slam things' (aka, You don't slam things) and I failed to notice the sloped edging of the black mat. The design of clogs have always kind of baffled me...they're much more narrow at the bottom than at the top, which is great if you like to break your ankle on every uneven surface. These things were seriously designed by a nation with cobble-stone streets? Predictably, my ankle buckled to the side and my lithe frame went flying. 'Luckily' there was a plastic house to catch my fall. After slamming into the house and moving it a good six inches across the floor, the wall being it's stopping point, I glanced around to see that no other adults spotted my fall from grace. Sure enough, Mr. Cool Dad was snorting into his sleeve in order to at least attempt social nicety. Too late, I'd already seen it. There was nothing to do but balance myself in a crouched position against the open window of the plastic house so that a) I could assess whether or not I'd broken my ankle b) I stopped laughing long enough to gain the strength to stand up again and c) I'd assured H and the other little boy inside that they'd not been the victims of an 'earth shake'. Cackling like a crazed woman, I returned to the table to relate my tale, which was greeted by head-shakes and blank stares...because I still couldn't compose myself enough to get it all out in one breath. Nothing like a little tumble to put you right back in your place. Yesterday, I finally started to feel like this whole residency thing would eventually come to a close. While J spent some time with the big wigs at his first hospital tour, I got to look at homes with a realtor and start to envision H and Charlie playing in the large, fenced back yards with our potential dog, sleeping in bunk-beds in a bedroom overlooking said yard and slurping cereal in the breakfast nook. We were treated to a fantastic dinner at a beautiful winery filled with laughter and ease, then drove to a gorgeous restored historic hotel; where I’m currently sitting on a plush King-sized bed in the hotel’s cushy robe while J sweats away another morning of interviews. And if that wasn’t enough, there was a huge wine and cheese basket filled with local decadence and a personal touch.